A number of hangups have kept director Guillermo Del Toro from unleashing a new cinematic concoction on to the big screen. After his 2006 superhero flick Hellboy 2: The Golden Army, the imaginative filmmaker was set to direct The Hobbit, the project falling through after a number of financial hurdles. After that, he stepped up to direct his passion project, the 3D, R-rated horror epic At the Mountains of Madness, set to be produced by James Cameron. Budget and material concerns put the kibosh on the film, leaving Del Toro looking for something new. We’ll finally see a new film from the Pan’s Labyrinth director in 2013, the epic robots vs. monsters blockbuster Pacific Rim, but thankfully, even a Hollywood obstacle course can’t stop Del Toro from leaving his stamp on the movie world. When directing isn’t coming together, the modern master of the fantastical turns to producing. In the interim of helming his own films, Del Toro has taken the role of overseer on a number of different projects, including a slate of horror movies (2010’s Don’t Be Afraid of the Dark and the upcoming Mama) and the last two years of Dreamworks Animation films, including Mastermind, Kung Fu Panda 2, and Puss in Boots. This week sees the release of his latest and, perhaps, most personal, animated endeavor, Rise of the Guardians, a film that teams up Santa, the Easter Bunny, the Tooth Fairy, the Sandman, and Jack Frost for a grand battle against the nefarious Boogeyman. Guardians‘ weaving of familiar, mythological faces shares more than a little with the superhero movies of late, so it’s fitting that when Hollywood.com met with Del Toro to discuss the cartoon epic and the many upcoming projects he has his hands in (including a stop-motion animated Pinocchio), the director was packing up a handful of freshly purchased few comic books…. Where do you buy your comics these days? 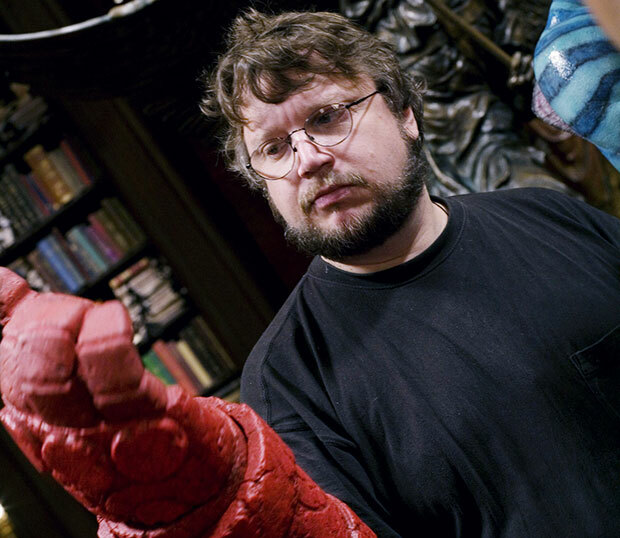 Guillermo Del Toro: In Manhattan, Midtown Comics, Forbidden Planet… Midtown is like a shrine. Funny you say “shrine,” because it seems like there aren’t many places for geeks to hang out. The Internet doesn’t have the same ambiance to it. Del Toro: You know what the funny thing is? This afternoon I’m going to an antique bookstore… there’s nothing like browsing. The other day I went to one of my favorite shops in L.A., The Iliad, and another called Adventures in Time and Space, and I spent a couple of hours just browsing. There is no substitute for that. Physically holding the book, seeing if it’s illustrated or not, reading the jacket, seeing who is the author — it’s very different. As a comic book fan, did you turn to past superhero comics in order to figure out how to bring the characters of Rise of the Guardians together? Del Toro: Ben Grimm and the Human Torch trying to get at each other in every issue of Fantastic Four. That’s certainly a dynamic you can identify with. X-Men… all these themes are interesting in the Marvel universe because they are not clean, goodie-goodie guys. They have neurosis. I think Marvel had them in their whole superhero mythology. They brought neurosis into the game. How did you know that these characters could blend together into something coherent? Del Toro: One of the things we tried to emphasize is that they don’t get along that perfectly in the beginning. Bunny hates Jack, Santa and Bunny have a rivalry of whose holiday is more important, and Sandy is the absent-minded zen master. Ultimately, them gelling together is a beautiful feat. Was there ever a worry about making mythical figures into characters that would strip them of their inherent magic? What made kids believe in them in the first place? Del Toro: The essence [is there]. It’s not like we made Santa fly and have x-ray vision. When we say superheroes, it’s not like they acquired superpowers. Santa is still the guy that can see joy in everything. He’s ill-tempered and a force of nature, but he’s not flying around with a cape. Bunny is not a superhero in the sense that he can use a webslinger — he just does what he does. They do what they do in the traditional sense. How did you carefully heighten them into heroes that could fight a villain? Del Toro: A lot of the time, believing and being earnest and gullible can be very confused in today’s atmosphere. The easiest way to appear intelligent is to be a skeptic. If I say, ‘Oh, I want to see that movie really bad!’ I sound a lot less intelligent than the guy who says, ‘That movie is going to be horrible.’ The skeptic seems like he knows more. So we wanted to create these characters without post-modern or pop culture winks or nods. We wanted to make them really earnest, romantic guys who love what they do. But make them so big that kids could say, ‘I believe in them,’ and not feel uncool. You’ve produced a number of Dreamworks Animated films, but where do you feel like your touch is apparent? 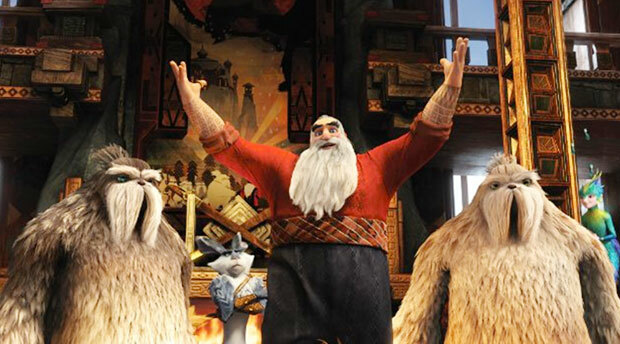 And where specifically in Rise of the Guardians? Del Toro: I think we, as a team, come up with stuff, but I think there are moments in the clash between faith and fear, in a few lines that I know came with discussions from me. The design of Bunny, the way the story is organized… but to go in and reference everything would be false — it’s really Peter’s movie. Whatever I have in common with him, it’s there. When we took Kung Fu Panda 2, I helped them distill the thematic element into a father and son story. The son healing about his past. Those are things that are second nature to me. It’s really what I’m interested in. In Guardians, it’s even closer to what I like. Did Dreamworks originally come to you or did you want to be involved with them? Del Toro: I came into them. Guillermo Navaro was working with them on Madagascar and he was telling me how great it was. And I always wanted to go back to animation, which I practiced as a pre-Cronos filmmaker. So I went there and I just renewed for another three years because I’m having such a great time. We’re trying to make the movies go in a slightly different direction than normal. You have a love for the tangible so it’s surprising you would embrace CG animation. Was that difficult? Del Toro: I think the fact that 2D animation isn’t practiced more is a crying shame. I think traditional animation should continue to be supported and celebrated. But I love computer assisted animation and I love stop-motion, which my Pinocchio is. I’ve been doing animation since Mimic. There are large parts of Hellboy and Hellboy 2 that are animated. Pacific Rim is the same thing — large portions of it require directing it like an animated movie. So I love the medium. 3D at Dreamworks is treated with religious zeal. We go through the whole process with Jeffrey [Katzenberg] asking us to maximize the experience for good. He hates when you try and do a cheap 3D gag. He says, ‘Don’t do that. That’s cheesy.’ Jeffrey’s a very powerful figure and he’s managed to catalyze and continue changing. Things like Dragons, Kung Fu Panda, co-existing with things that are completely dissimilar to that. There’s a beautiful eclecticness. Have you persuaded them to take a chance on a 2D animated project? Del Toro: I think the pipeline of Dreamworks is so boutique, even now when they’re expanding, is still something that you can not vary like that. But I personally am pursuing it. I’m doing stop-motion with Pinocchio and 2D animation as a producer. Projects I’m pursuing with European directors as producer that I haven’t been able to setup. I’m trying to support Spanish animators. 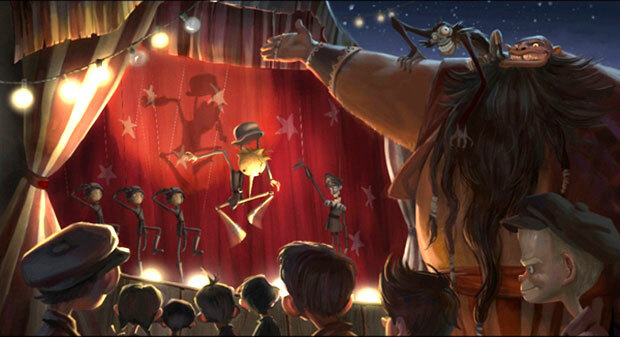 How hands on are you with Pinocchio? Del Toro: I am there all the way to the shoot. And then on the shoot you really have to be there at the morning and the end of the day — otherwise you would be there for 51 weeks. You don’t shoot in one stage. In order to complete a feature animation in 51 weeks, you need to shoot in-between 10 and 15 stages. So you have 15 stages under one roof and there’s no way unless you’re the holy spirit to be in 15 stages at one time. So you check in the morning to see how the few seconds came out the day before, you check in at the end of the day and see how the new few seconds looked. Is the superhero genre flowing through the veins of Guardians something you want to tackle yourself? Del Toro: I actually want to direct horror next if I can. I’ve produced — the last one is Mama which comes out in January — and I love that dynamic. There’s a project called Crimson Peak that I really hope happens. PHOTOS: Superheroes and Supervillains: They’re Just Like Us! In the past, you’ve made films that have very specific audiences — does working with Dreamworks make you want to tackle a kid-oriented movie? Or is the hope to make movies that play across the board? Del Toro: Across the board. There are still projects that I’ve been writing in the Pan’s Labyrinth/Devil’s Backbone mold for a while and I can’t finish the screenplay. One is 40 pages in, the other is 60 pages in. Those are very slow. Devil’s Backbone took years, Pan’s Labyrinth took years. I do want to do adult bizarre movies still. But when you’re a kid you can be an astronaut and an Indian and a cowboy and a submarine explorer — you don’t need to do one thing. That’s how I feel as a director and producer. I want to do a little of this and a little of that. I love it all. Guardians was something that was a passion project. Puss and Kung Fu Panda… we took them absolutely to the wire in trying to make them as beautiful and crazy as we could do it. That feels like the goal for Pacific Rim too. Can the action be as nimble as in animation? Guardians has impressive single shot sequences. Del Toro: I think there is a fluidity to animation and that there are certain stories you can not tell in live-action. I’m interested in telling the story of the Guardians. And I’m interested in telling the story of the one I wrote for Dreamworks, Troll Hunters, which will be in the future, I don’t know exactly when. But those stories can only exist in animation. Why can Troll Hunters only exist in animation? Del Toro: [Laughs] The way we treat the Trolls and the way we treat the action — it needs the fluidity of animation.